It is striking that the great thinkers, from Aristotle to Augustine and Mencius to Montaigne, devoted so much of their time and thought to friendship, but almost none of either to marriage. Grayling’s timely treatise reacquaints us with a great but forgotten good that promises to fulfil so many of our practical, intellectual, emotional, and metaphysical needs. The book principally consists of a history of the philosophy of friendship capped by an account of canonical, often homosexual or homosocial friendships such as that of Achilles and Patroclus and Jonathan and David. 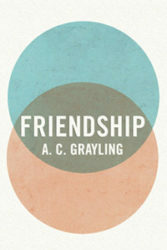 Throughout, Grayling seeks to define friendship and, in so doing, explores its many forms, facets, charms, and consolations. Perhaps in a desire to be modern, relevant, or politic, Grayling seems to reject the classical notion that, at its best and most meaningful, friendship is a highly elitist good. For the greats, only virtuous men can be ideal friends. Aristotle famously says that, while there are many ways for men to be bad, there is only one way for them to be good, and it is precisely in this sense that an ideal friend is ‘another self’- a historically important notion that Grayling severally dismisses. Because they are all one and the same, virtuous men are predictable, reliable, and therefore worthy of one another’s friendship. In contrast, bad people are in some way unlike themselves, and just as likely to hate other bad people as anyone else. In my opinion, Plato, whom Grayling underrates, advances by far the most subtle and sophisticated of all theories of friendship, one far superior even to that of Aristotle. Despite the extravagant praise that he lavishes upon friendship, Aristotle is quite clear that the best and happiest life is not that spent in friendship, but in the contemplation of those things that are most true and therefore most beautiful and most dependable. There is a contradiction here: if the best life is a life of contemplation, then friendship is either superfluous or inimical to the best life, and therefore undeserving of the high praise that Aristotle lavishes upon it. It may be, as Aristotle tentatively suggests, that friendship is needed because it promotes contemplation, or that contemplation is only possible some of the time and friendship is needed the rest of the time, or even that a life of friendship is just as good as a life of contemplation. So much for Aristotle, one might say. Plato’s Lysis may seem to fail in its task of defining friendship, but one should never take Plato or his mouthpiece Socrates at face value. There is far more to the Lysis than a couple of interesting but misguided thoughts on friendship. By discussing friendship with Lysis and Menexenus as he does, Socrates is not only discussing friendship, but also demonstrating to the youths that, even though they count each other as close friends, they do not really know what friendship is, and that, whatever friendship is, it is something far deeper and far more meaningful than the puerile ‘friendship’ that they share. In contrast to the youths, Socrates knows perfectly well what friendship is, and is only feigning ignorance so as to teach the youths: ‘…and I, an old boy, who would fain be one of you…’ More than that, by discussing friendship with Lysis and Menexenus as he does, Socrates is himself in the process of befriending them. He befriends them not with pleasant banter or gossipy chitchat, as most people ‘befriend’ one another, but with the kind of philosophical conversation that is the hallmark of the deepest and most meaningful of friendships. In the course of this philosophical conversation, he tells the youths that he should ‘greatly prefer a real friend to all the gold of Darius’, thereby signifying not only that he places friendship on the same high pedestal as philosophy, to which he has devoted (and will sacrifice) his life, but also that the kind of friendship that he has in mind is so rare and uncommon that even he does not possess it. If friendship ultimately escapes definition, then this is because, like philosophy, friendship is not so much a thing-in-itself as it is a process for becoming. True friends seek together to live truer, fuller lives by relating to each other authentically and by teaching each other about the limitations of their beliefs and the defects in their character, which are a far greater source of error than mere rational confusion. For Plato, friendship and philosophy are aspects of one and the same impulse, one and the same love: the love that seeks to know. Just as philosophy leads to friendship, so friendship leads to philosophy. In the Phaedrus, Plato’s most important work on friendship (although not generally recognized as such – Grayling fails to mention it), Socrates and Phaedrus go out into the idyllic countryside just outside Athens and have a long conversation about the anatomy of the soul, the nature of true love, the art of persuasion, and the merits of the spoken over the written word. At the end of this conversation, Socrates offers a prayer to the local deities. This is the famous Socratic Prayer, which is notable both in itself and for the response that it elicits from Phaedrus. Plato may fail to define friendship in the Lysis, but in the Phaedrus he gives us its living embodiment. Socrates and Phaedrus spend their time together enjoying the beautiful Attic countryside while engaging in honest and open philosophical conversation. By exercising and building upon reason, they are not only furthering each other’s understanding, but also transforming a life of friendship into a life of joint contemplation of those things that are most true and hence most beautiful and most dependable. If only on the basis of his response to the Socratic Prayer, it is obvious that Phaedrus is another self to Socrates, since he makes the same choices as Socrates and even justifies making those choices on the grounds that their friendship requires it. Whereas Aristotle and Grayling try to tell us what friendship is, Plato lets us feel it in all its allure and transformative power.